Over the past few years, Instagram has grown leaps and bounds in terms of its popularity! Whether scrolling on my own, or working in the field, I’ve started to realize that just about everyone has an account…. or two…. or three. Instagram accounts fall under many categories. We all have a personal account, sure, but what about your second account? It’s not enough to just have one! We’re either sharing unedited selfies on our “finsta” (fake instas), speaking in the voice of our dog on a pet account, or trying to become the next “girlwithnojob” ”with a meme account. Honestly, it’s a lot of work, but of course I’m in on the action too. My second account is what I deem my hobby account. I can see why having a couple of accounts is fun. It’s a way to tap into another subculture or secret passion, whether that’s pretending you’re a french bulldog or in my case, party planner. @TheTableRunner is my way to share on of my favorite pastimes, entertaining friends. I love dinner parties, holiday events and any excuse to have good food. Whether it’s Christmas or the start of The Bachelor, I try to create a table spread worth sharing on Instagram. I hope to share more details about certain parties and tablescapes here since space and dedication is limited on running the Instagram account. So if you’re into charcuterie boards, themed cocktails and pretty tableware, @thetablerunner would love your follow! I’ve sprinkled in some highlights from the account here, and will be doing a feature on a fall table spread here shortly! What’s your second instagram account? I love seeing what my friends are coming up with on their other accounts. Share them below! Earlier this week, I mentioned that my visit to Los Angeles was a huge success. Not only was it sunny and relaxing, but it represented a new path that I’m setting myself on. It’s a path I’d already been working on over the last couple of months, and getting back to blogging was a part of it. I came back to writing and blogging to fill a void that I felt was desperately missing. As the first year in the real world had flown by, I realized that the pace of work and trying to just “keep up” was hindering other avenues of my life. Creativity, relationships and most importantly, purpose, seemed to be at all time lows. I had to ask myself, how can I hit pause, reset, and then hit play again on my own life? I decided that in order to rediscover purpose, I had to take inventory of everything. There came a point where some tough decisions had to be made. What do I actually have passion for? Who and what is bringing joy to my life? What are the risks of taking a leap of faith, or playing it safe? How do my daily decisions relate to larger ones down the road? As a perfectionist who puts a lot of pressure on himself, getting to those answers wasn’t easy. Facing my reality and then answering those tough questions has been a challenge. But if I want to be a successful adult, I had to. Once I got those answers and leaned on supportive friends and family, I knew that in order to get to a better place, I needed to fully devote myself to the cause and change courses. That has meant that in relationships, I want to find quality and honesty. In my day to day, it’s about taking what life throws at me and appreciating the challenges. Lastly, in my career, it’s about passion and purpose. I recently decided to devote myself fully to searching for my next job and although it’s perhaps one of my riskier moves, I deem it one of my best. Embracing the risk I’m taking is the only way I can develop and grow stronger. Meeting new friends and having the support of old ones who have experienced similar situations has been such a wonderful way to get through this change. I’ve always been a firm believer in “everything happens for a reason” and I continue to repeat that as I step further into adulthood. Change is a thing you can count on. Now it’s time to count on myself too. I recently read that “a great trip sets you down a path that doesn’t end when you return home” and that statement couldn’t ring more true with my first visit to California last week. I’ll be diving more into that “path” a little later on in the week, but for now, let’s get into my adventure on the West Coast, shall we? Inspired by both the need to see one of my best friends and the desire to live out my Ingrid Goes West fantasy, I made sure to see as much of Los Angeles as possible during my first visit to the West Coast. The agenda was jam-packed but I wouldn’t have had it any other way. My personal philosophy during a trip is to get a lay of the land as quickly as possible with a sight-seeing tour. It may seem traditional, but any sort of classic sight-seeing tour allows for you to get in some history and understand the layout of a city before you start exploring it on your own. Since LA is extremely massive and diverse, a StarLine tour seemed crucial. Although the tour guide was a bit…. redundant, there were some highlights. Photos at The Hollywood Bowl, lunch at The Farmers Market and strolling though Olvera Street were great first moments in Los Angeles. As an aspiring “Bravo-lebrity” my first full night ended at Pump and Sur in West Hollywood, of Vanderpump Rules fame. People watching has never been better! Day two took a detour south, heading to San Diego! After a scenic two hour drive down the California coast, we finally made it. San Diego is stunning. With plenty of sunshine, boats and friendly residents, I could have stayed longer. Before heading into the city, we stopped at Liberty Public Market, a food hall style epicenter with plenty of flower shapes and boutiques too. The true mission was to see Hotel Del Coronado, the famous hotel and San Diego landmark. Charming and quaint, yet opulent, the “Del” was picture perfect. Coronado Island is lined with trendy shops and restaurants. Before heading out of town, we stumbled upon Solunto in Little Italy for a late lunch. Back in Los Angeles for my last full day, the morning began at Gjusta, a Venice bakery and deli known for plenty of local flavor. Following that was a scenic walk around Abbot Kinney Blvd for shopping and photos, it was nothing short of a Instagram gold mine. The afternoon was topped off at Nobu for drinks in Malibu, while jamming to California Girls and yes, Malibu, on the way to and from. A delicious dinner at Osteria Mozza was followed up by a drive to Griffith Observatory. If you find yourself in LA, I believe it’s a must see. You’ll be channeling your inner Emma Stone and Ryan Gosling in the City of Stars. As my trip wrapped up, my last morning was spent in Venice and Santa Monica. Venice is home to the laid back surfers and skaters that I’d seen plenty of times in TV and movies. After a breakfast at Rose Cafe and checking out the vintage shops in Santa Monica, I made sure to get a sushi lunch at Sugar Fish before one final drive through Beverly Hills. All in all, California did not disappoint! Never short on good weather or a colorful photo opportunity, I couldn’t have asked for a better first visit. Having a local show me the ropes made the trip even better. Check out this map to see every spot I hit and stayed tuned for more adventures. I’ll be writing about past and future travels very shortly! Before I begin, I wanted to give a quick shout out to everyone who has been reading and reaching out to me about the relaunch! I’ve always been lucky to have great support from my friends and family with all of my creative endeavors. Kind words and encouragement make doing projects like this worth it. Now, back to business. I think we’re all aware that Mother Nature hasn’t been the kindest to us lately. In Chicago, she’s decided to deliver a heat wave like no other at the end of September, a time that’s usually reserved for crisp winds and the leaves changing colors. Chicago’s officially a summer later bloomer it seems. How can people enjoy their pumpkin spiced lattes everything when it’s 91 degrees out? The jury is still out on the answer to that, but I’ve got more important problems at hand. One being how to dress through the heat with fall fashion in mind. With the itch to dress for fall but a temperature scale off the charts, it’s all about compromise. Color palettes are an easy place to start! I personally pick out a few colors to build my wardrobe around each season. This fall, I’m trying to wear shades of green and more tan tones. Although Labor Day is over, I’m still wearing white (sue me!) because it’s an easy summer staple that you can build a fall look on. Option 2: It’s too hot for a scarf, but it’s never too hot for a bandana! I may be late to the bandana party but I’m still showing up. Although it’s trendy, when worn in a neutral print and color, it can show you’re ready to embrace another layer of fashion without it adding to much heat. Plus, it’s honestly a very inexpensive accessory. I hope your start to fall is a little bit cooler than mine has been! These looks might be working, but I’m ready to really enjoy fall fashion, are you? I’m heading to Los Angeles tomorrow and look forward to sharing my travel agenda after! In the meantime, you can follow along for photos and trip updates at my Instagram here. This summer, I was thrilled to be asked to write a story for an online magazine about my love for sharing color on my personal Instagram page! The team at Allegory Ridge reached out and it was a fantastic opportunity I could not pass up. I’ve attached my personal tips on achieving a color coordinated feed you can be proud of below. The rest of the article can be read here! You might be thinking that finding all these colorful opportunities isn’t easy, and you’d be right. I often find myself stumped when looking for the next shot. So what’s an instagrammer to do? Here are some tips to start incorporating the color you want both in photography and your everyday design. Get inspired: I’ve always loved the challenge of keeping my Instagram (and life) vibrant, but this past year, I was craving color more than ever. A trip to the Caribbean, full of pastel houses, candy-colored cocktails and bright blue oceans, was just what I needed. Not only was it fun to capture color through my lens, my skin wasn’t complaining either. Friends were receptive to my photos and now, I try to find color wherever I go because it can lead to inspiration for spaces in my apartment, or the theme for my next party. Keep your eyes open: Color is everywhere, even in the most unsuspected of places. Little boutiques, faded murals around town, and street markets are just a few places I find color. Get out and be on the lookout, it’s out there waiting for you. You never know what a random quick snapshot could turn into. Trust your instincts: Self-doubt is not your friend, especially in art. If you love the photo or piece, stick to it! The best thing about artistry and photography is that everyone has a unique point of view. No two shots are the same so share what you love. Keep it cohesive: This is probably the hardest part! It takes a lot of patience to keep it all looking unified and colorful. I follow a (self-made) formula. 1 color should be dominant, with 2-3 secondary colors. The next photo will take one of the first photo’s secondary colors, and make it the primary. The cycle continues until you’ve phased out the original primary color. Thanks again to Allegory Ridge, for letting me share my colorful perspective! The old saying goes “Everything’s bigger in Texas” and a weekend in San Antonio and Austin proved that right! If you’ve had the opportunity to study abroad, you know the friends you meet during that experience are the perfect travel companions. This visit reunited some of my study abroad crew and just like our time in Europe, we made the most of every minute in the Lone Star State. Heading into this trip, I had very little knowledge of both cities, specifically San Antonio. Upon arriving I was greeted with warm weather and a prickly pear margarita at La Gloria, the perfect backdrop against San Antonio’s River Walk. We picked perhaps the best weekend of all to visit San Antonio, the last weekend of Fiesta, the city’s biggest event of the year. Celebrating San Antonio’s heritage, Fiesta is full of colorful decorations, delicious street food, and live music all night long. Other highlights of San Antonio included the Historic Pearl district, the River Walk, and brunch at Ocho! Honestly, I was pleasantly surprised with San Antonio. The never ending colorful backdrops and unique history left a charming taste in my mouth. Luckily Austin is just a little under 2 hours away from San Antonio and well worth a day trip! San Antonio almost feels like a part of Latin America while Austin had a much more urban, American city feeling to it. 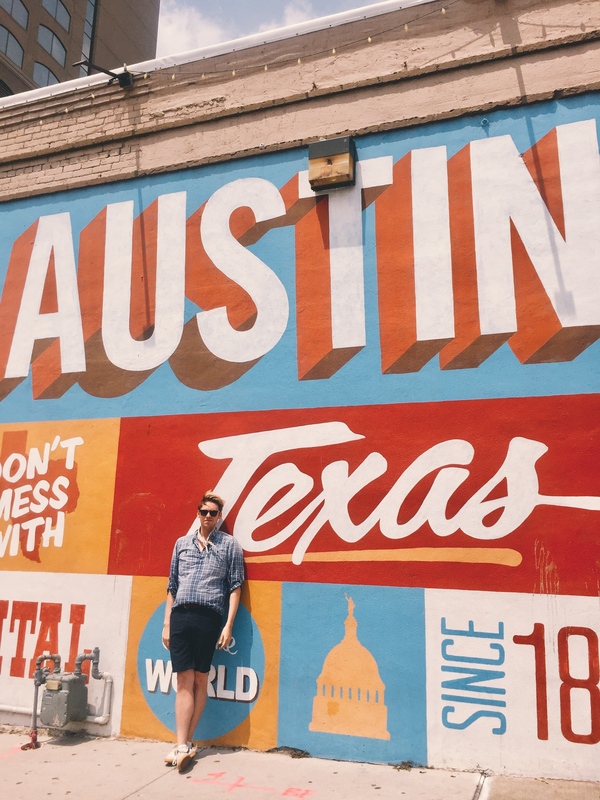 Lined with trendy shops and even trendier residents, the highlights included South Congress, for shopping, and grabbing photos of the amazing street art throughout the city! We topped the night off with a perfect seafood dinner at Clark’s Oyster Bar. Whether it’s BBQ or Tex Mex, margaritas or mojitos, Texans know the way to your heart is through your stomach! In my opinion, Texas is best explored if you embrace everything and every dish! It was a fantastic change of pace from the bustling city life that is Chicago. Southern hospitality never goes out of style! Check out my Google Map here with every stop I made on my visit and check back for the next travel update. After traveling outside North America in high school and abroad in college, I realized I had a lot of ground to cover in my own backyard. It shocked me that I hadn’t even been to neighboring Canada after all of these years. Last summer, I wanted change that! As a kick-off to adulthood, Vancouver became my first trip to Canada and I couldn’t have been more pleased with my visit. Celebrating college graduation, Vancouver was the perfect combination of adventure, great hospitality and fantastic food. Hotels ranged $200/night so it seemed more cost effective to stay in an AirBnB. It was my first experience but it was honestly fantastic! Clean, modern, and in the trendy Chinatown neighborhood, we loved having a place to ourselves. Having the option to play Netflix during downtime didn’t hurt either. I’ve attached the listing here. Bao Bei– Chinese is my absolute favorite cuisine, but I won’t lie, it’s because I love General Tso’s and spring rolls. This was no Panda Express. Bao Bei was a great trendy asian restaurant in Chinatown with plenty of noodles and spicy dishes and just steps away from our Air Bnb. Miku– If you’re looking for fresh seafood and sushi, Vancouver is the place to do it. Every bite was fresh and full of flavor. Belgard Kitchen– After a long day of tours, Belgard Kitchen was like a brewery for wine. The rosé flight was a perfect refreshing way to end a long day of touring. There’s plenty of charcuterie boards too! The Keefer Bar- Just steps from Bao Bei and our AirBnb, The Keefer Bar had amazing and unique cocktails. You could really tell the bartender knew what she was doing, asking what flavors and liquors we preferred to craft the perfect creation. Granville Island Pubic Market– Plenty of shopping and local markets cover Granville Island Public Market. Lots of great gift shops and breweries are perfect pit stops in between trying lots of local fare. Capilano Suspension Bridge– Test you balance and photography skills at this landmark. The bridge and surrounding trails are breathtaking, and there’s a great cafe serving poutine after you’ve crossed back and forth. Grouse Mountain– If you need to fulfill your sense of adventure, I’d suggest checking out Grouse Mountain. High above Vancouver, you’ll get a perfect few of the mountaintops while zip-lining in the summer, or skiing in the winter. You can also hike trails or watch Lumberjack themed games. Gastown– The best shopping and dining is probably around Gastown! It’s a very scenic area, with cobblestone streets and old world charm. I’ve chronicled every stop we made on this google map. As you can see, Vancouver is quite small, and extremely easy to travel around, by foot or even bike. **Uber was unavailable when I was there. Keep in mind that Vancouver is quite expensive, but its kind locals and charm are worth it! It’s a great melting pot of many cities I’d been to before. Nestled in the Pacific Northwest, it’s part New York and part London with a dash of European flair and a sprinkle of Boston. It’s so uniquely like everywhere else, a tour guide told us it’s a popular filming location because it can easily be dressed as other metropolis cities. I can attest, as we walked through several filming shoots and even saw Seth Rogen on our first night out. So if the question is, should I visit Vancouver, the answer is … O, Cana-DUH!